I've used the same template since I started this blog a few years back. I never liked it much, but it suited me better than the others. It wasn't until today I realized how many free templates are available for download. I might toy around with a couple options until I find a keeper. In the meantime, please excuse the dust. That’s what I called it when my mom was looking for her house. She wanted to live outside of Vegas, she wanted horse property, and a sturdy well-constructed home priced just right. She had a handful of other requests, too, which made the search even more challenging. We looked at hundreds of homes and bare land in Sandy Valley, Overton, Meadview, and Pahrump before we found it – the unicorn, the thing that only seemed to exist in dreams. I couldn’t believe it – it took time, but she found just what she wanted. Now, it’s Frank’s turn to seek a unicorn. After the Jimmy broke down in the wash and I had to rescue Frank, Mike and Amy, Frank started thinking that we really needed a second four-wheel drive vehicle. One powerful enough to handle recoveries and tow the Jimmy for long trips (we really want to go to Moab, but the Jimmy doesn’t handle the highway well). While I was away, Frank found a Suburban for sale on Craigslist. He took it for a test drive and he really liked it. We talked it over, and determined the only way we could afford it is if we sold his Monte Carlo. He had previously researched its value and knew it was worth around the amount as the Suburban. So, I suggested he go to Carmax and get the car appraised. I remembered that they'd buy a car, no questions asked; it seemed like the easiest and quickest way to get money in hand. They offered Frank a fair price; he thought it over, and he went back the following day and sold them the Monte. They cut the check right there and then, it was painless and we feel like they did us a huge favor by not having to deal with the hassles of private sale. He deposited the check, but our bank placed a hold on the funds. We’ve been none to happy with our bank lately; this was just the topper, but that’s a story for another day. The delay of the funds got Frank thinking more about what he wanted. While, the Suburban is an excellent deal and has what we need, it lacks what he wants. He’s opted to keep looking. Yesterday, he was a bit frustrated because what he wants just doesn’t seem to be for sale. I told him to be patient. He has the help of nearby dealers, plus, my mom is on the look out in Pahrump and his friend has the Phoenix area covered. I’m sure he’ll find his unicorn, too. Well, I don't think it's that good, but what can you do? The name was coined by weightwatchers, not by me. If I were to name the recipe, I'd call it Pretty Darn Tasty Banana Muffins. I turned the bread into muffins, and only had one egg on had so I used the yolk, instead of two egg whites - my version was moist and flavorful. I froze half and defrosted them yesterday. I had a muffin for breakfast this morning, it still tasted good. Although, the tops of the muffins were sticky or kinda gummy. I'll have to find a better way to store them. Preheat oven to 350. Combine sugar and light butter and mix until creamy. Add banana, milk, sour cream, egg whites and mix well. In a seperate bowl combine flour, baking soda and salt. Then, mix dry ingredients into creamed banana mixture. Lightly spray a loaf pan. Pour batter into pan. Bake at 350 for 1 hr, 10 min. Test for doneness with wooden toothpick - should come out clean. Cool for 10 min and remove from pan. A lot has been going on since I last posted. I remember a week ago, I was getting ready to write about my baking adventures and new haircut. But I got a call from my brother, he told me my grandpa lost his battle with cancer; he had passed away a couple hours earlier. I talked to my dad and told him that I'd shop around for flights and I try to make it in on Wednesday. I'd call once my plans were confirmed. Southwest is my preferred airline to Chicago, they wanted over $700 to fly round trip. That's insane! I spent the day comparing fares. Expedia offered me the cheapest option at $332, but it required me to tour the country and fly two airlines. After hours of searching, I knew it'd be rough, but it was my best option. Normally, it's a 3 hour and 30 minute flight non-stop LAS to MDW. I had the pleasure of taking the scenic route, Las Vegas to San Francisco to Denver to Chicago, nine hours of travel time. It was exhausting, fortunately, all my flights ran a bit early. I arrived in Chicago right on time. Chicago was cold, windy, snowy and icy, about an inch had fallen right before I got in. My brother was 15 minutes late, by then I was freezing, I called to find out how far away he was - thinking I'd warm up inside if I had the time. He was a minute away in the cellphone lot, assessing damage, he hit a construction sign on his way and damaged the bumper and headlight on my dad's van. The bumper grinded on the tire whenever you'd turn, hit a bump or pothole (every two feet in Chicago). Mike didn't want to drive home, I took the wheel, nervously. My dad's van is huge, the roads were slick, lanes were poorly marked, I was afraid the tire would blow at any minute and I was shivering non-stop. It was slow-going the whole way, but we made it safe and sound. Amy was at my dad's when Mike and I arrived. We visited a bit and then she and I ran to White Castle. I was starved. Two double jalepeno cheeseburgers hit the spot. She left shortly after. I was beat despite doing nothing more than traveling all day. So, I said goodnight to my dad and Mike and turned in. Thursday morning was leisurely. Around noon, I was hungry, my dad bought fixings for Italian Beef. I made myself a sandwich, it was so good, I had two. Before I knew it, it was time to head to the wake. Visiting hours were 2-9pm. My dad, Mike and I were second to arrive. The rest of the family showed minutes later. My aunts' put together picture boards of photos that spanned my grandpa's 76 years. Saw friends and family I hadn't seen since August 2007, some were longer, more than six years. I kept an eye on Nicky, my young cousins, and other kids - kept them occupied when they'd get restless. Nicky was a trip, he'd walk up beside my grandpa's casket and yell, "Papa, wake up! ", I tried to explain to him that papa was in heaven and he won't be waking up, but an hour later he was back there at it again. In the meantime, he'd tell anyone that'd listen that papa was sleeping. After the wake, Amy, Jeff, joined Mike, dad and I back at dad's house. Jeff's stepmom took Nicky home an hour earlier to put him to bed. We visited for awhile, they left, and we went to bed knowing that'd Friday would be an early morning and long day. Friday was the funeral. The services were very nice. The weather wasn't too bad, the sun was warm, the wind died-down, so the cold temps didn't feel as bad. Nicky went to his uncle Brian's during the church service, Amy and Jeff learned from previous funerals it's impossible to keep him quiet. They picked him up afterwards so he could join us for lunch at Gaelic Park. Lunch was good, I could have eaten at least four more cups of their cream of chicken soup - it was delicious. Aside from that no chicken was served (my grandpa hated chicken) and Guinness flowed freely. It was a proper send off. From there, we went back to the funeral home to pick up flowers and our belongings. My aunt and uncle invited the immediate family back to my grandparent's house. My uncle's goal was to polish off what was left of my grandparents' booze. It was an odd feeling to be at their house without them. Last time I was there was November 2007, just days before my grandma passed away. The strange feeling subsided and we had a good time looking at old photos, laughing, sharing stories and old memories. I'm sure grandma & grandpa were there with us, and they wouldn't of wanted it any other way. Early on Amy ran to Portillo's, I had her get me a Chicago-style dog. It was very tasty. Then, later, around 6:30 everyone was pretty tanked. Dinner was in order, my cousin suggest ordering Beggar's Pizza. I planned to have dinner at Giordano's, my favorite place for stuffed pizza. But I decided to give Beggar's a shot, Frank and I used to eat their thin crust pizzas regularly when we lived at our apartment in Lansing, those were always good so I figured it'd be a safe bet. My uncle assured me it'd be good. It was a mistake. I didn't like it, they use cornmeal crust, it's too thick and lacked cheese. It was more like deep dish than stuffed. Disappointing. We hung around a couple more hours and then everyone headed home after they sobered up. I crashed around 11:30 I was so tired I couldn't keep my eyes open anymore. Saturday, I chatted with my dad all morning. I had lunch plans with Bob, he drove up from Kentucky to help out, father-in-law was released from the hospital on Wednesday, well, I think it was Wednesday. Anyway, he picked me up and we went out to Golden Palace, a Chinese restaurant in Lansing, a couple miles from the Indiana border. It was Frank and my favorite place when we lived there. I was happy to see the same family was still running it. We ordered egg rolls, beansprout noodle and orange chicken, we also had tea and almond cookies. So so good, you can't find Chinese food like than in NV or KY. We were stuffed, but happy as can be. Before he took me back to my dad's, I visited with him and the in-laws for a couple hours. Frank's dad is doing well, he looks good, he seems to be well on his way to a full recovery. Amy and Nicky were at my dad's when I got there, Mike was for a bit, but he left to see a show with his friends. The three of us visited and played with Nicky. It was hilarious to see my dad and Nicky play "ring around the rosy" around the stripper pole that's in his living room. Yes, you heard right. After Christmas, Mike bought a stripper pole, and it's in the middle of the living room at my dad's house. 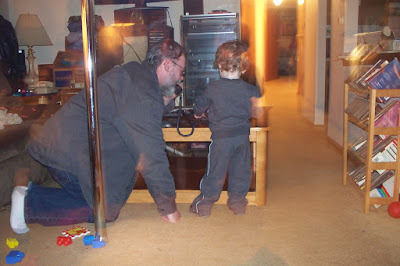 As soon as Nicky would get my dad up then he'd run off and do something else, leaving my dad alone at the pole. In this picture he took off to play telephone. My dad joined him. Nicky took pictures with my camera so the settings were off - it's distorted, but you get the idea. Hunger struck, I was torn, I couldn't decide if I wanted Giordano's or a gyro. I settled on a gyro, we got them from Markella's. They were really good, even better than Nicky's were I usually go when I'm there. We hung by my dad's the rest of the night. Jeff came by and Mike came back after the show. We played cards and talked. Around 2am, my eyes were getting really heavy. I knew I needed a nap, I slept for an hour and a half, they stayed up. I packed my bags, my dad gave me Italian Sausage and pancetta to take home - frozen, so it'd make the trip. I said good-bye to Mike and my dad. By 4:15, Amy, Jeff, Nicky and I were off to the airport. We said our good-byes and I took off for my longest day of traveling ever. I left Midway for Denver at 6:10, arrived on-time, but my flight to San Francisco was delayed - issues at SFO. We were cleared to leave about an hour behind schedule. Arrived in San Francisco. It was pouring, the rain came down in waves. My flight to Vegas was delayed three hours. I walked the airport, bought sourdough bread and a book to pass the time. By then, I had read everything I brought along and done more word searches than you can imagine. I'd close my eyes and I'd see letters float around. I read until it was time to go and finally at 1:30 we were boarding - on my way home, finally! 13 hours in airports and on airplanes is no fun. I was absolutely thrilled to be home. It was cloudy, but the 70 degree air felt wonderful. Frank picked me up and we zipped home. Overall it was a good trip, given the circumstances. It was nice to spend time with my dad. I saw him more in those few days than I have in the last ten years. We've had our high's and low's over the years; I want to put troubled times behind us and work to build a better relationship. I think this trip helped us take steps to do so. The last few years have been tough for my family, we've lost many loved ones, I hope my grandpa's death closes this chapter of our lives, and happier and healthier times lie ahead. You might remember, last week, I mentioned that Wynn sent us an offer. I thought I'd follow up on that. We did call to reserve Thursday night, but instead of lounging in the lap of luxury we were comfy at home. Honestly, I wasn't a bit disappointed it was nice to be home and catch up on dvr'd shows. When Frank called marketing to make the reservation, earlier this week, they no longer had any nights available at Encore. All they could offer us was a room at Wynn. We stayed there twice before so it wasn't worth it to us. We'd like to check out Encore and knock another property off "our list". Hopefully, we'll get a second chance. The family's gone, my mom and I took them to the airport yesterday when I got off work. It's always hard to say good-bye we were all in tears during our so long. Nicky was sweet, he told grandma not to cry when she went to give him one last hug. My mom treated us to dinner at Grand Lux, then we took her home. We returned to the house, it was silent. Only scattered items, crumbs on the floor, and fingerprints remain. My house is pretty trashed, but I have a three day weekend coming up. So, I'll be able to get things back in order and catch up on sleep. I am very much looking forward to sleep. From the moment they arrived until they left it was go, go, go. It can be overwhelming, and it doesn't take long for exhaustion to set in. It'd be so nice to have them close so we could see them a couple times a week at a much mellower pace. Maybe someday, but in the meantime, I wouldn't trade those chaotic couple weeks a year for anything. Here's a few videos of my favorite boy. He likes to sing and pretend the desk is a piano. Nicky sings from kellee on Vimeo. It's terrible, I find this one hilarious, watch until the end. nicky sings and falls from kellee on Vimeo. Nicky loves us from kellee on Vimeo. No one is a stranger to the cries over current economic troubles, including Las Vegas. The city has been feeling the affects the last few months. People are still visiting, who can resist the deals? but they’re spending less. Many casinos are turning good profits but insane debt payments and/or substantial construction costs have them over their heads. Layoffs, restructuring, and budget cuts have been the buzz words of late. At the end of last year, Frank was able to dodge the bullet and keep his job. He stepped into a new position with more responsibility, the understanding that it was a lateral move and no bonuses would be awarded in 2009. Bonuses are figured into salary so that was a pay cut – more work, less pay - pretty typical of corporations' pinching pennies. Another round of layoffs are rumored; it’s been quite stressful. He got word that he’s safe so far, but he’ll no longer be matched for any 401k contributions and he is forced to take a 5% cut in pay. Not great circumstances, but he keeps his job. That’s what’s important. My only hope is that things turn around soon. I’m not too confident that he’ll be safe the next time they’re looking to cut costs. And I feel partially responsible. We drove by the Tropicana/Ft. Apache location the other night and there were no lights on, we parked and Amy hopped out to read the sign on the door. It stated “Closed due to the Economy”. What a bummer. I haven’t had another cheesesteak that was nearly as good as those at Philly Steakout. They flew in ingredients from Philly, which made made their sandwiches the most authentic around. In recent months we've been eating out a lot less and we started eating healthier in the New Year so we haven’t had cheesesteaks since early December. I think we may have been keeping them in business by stopping there weekly or, at least, a few times a month. Seriously, I doubt our lack of visits alone had much impact, but it really is a shame. They will be missed. After work on Friday I made my way over the hump to Pahrump. It started raining at Tecopa and it’s rained off and on since then, I think it finally stopped drizzling mid-morning today. It sure put a wrench in our plans, we intended to hang by my mom’s this weekend so Nicky can drive his viper, ride his horse, chase chickens and play in dirt. But when it rains, my mom’s land turns into muddy quick sand; it’s no fun at all. Keeping him inside with all the animals in sight out the window would be pure torture – for everyone. So, they decided they’d come to Vegas on Saturday. We had the local Chinese buffet for dinner, and visited for a bit. Then Mike and I set off for our night of gambling. We drove back to Vegas; we got to the Hard Rock around 11:30. It’s been Mike’s favorite property since his first trip nearly nine years ago. Now he’s 21, he was in heaven, it could have only been better if he had a bankroll to throw around Nick Pappageorgio style. The bars and clubs were hopping, the table games were pretty busy, but the slots were pretty dead. It worked in our favor because the cocktail waitress came by regularly. We played a few penny slots and I showed him how video keno works. He wanted to play the numbers from his fortune that he got from his fortune cookie earlier. We had a slow burn going with our money. We hung around for a couple hours then he wanted to hit the strip. We parked at Harrah’s, he wasn’t feeling the vibe so we went to check out Carnaval Court the rain curtailed any fun there, they were packing it in for the night. We went on to IP. Good crowds in there, a little too crowded so we kept on heading south. Next stop was Flamingo, it was pretty busy in there, too. Nothing caught Mike’s eye, so we went to Bally’s. It was a ghost-town. We were able to get drinks playing slots real quick so that was nice. All players’ clubs seemed to be closed so he wanted to go somewhere he already had a card for so we decided Bellagio would be the next stop. We walked right past the penny slots near the shops entrance and wasted a lot of time looking for them. Bellagio’s clubs were pretty busy but the rest of the place was eerily calm. I’ve never seen it like that. I wanted to play VP I found a decent bank of games, we sat and got comfy. I showed Mike how to play, instructed him on what to keep and what to toss. He picked it up quickly. We played for an hour roughly and not a single cocktail waitress walked by. So, when my buy-in was gone, we booked it. We went to Bill’s. Crazy busy in there at 3:30. We made our way back to Harrah’s. Mike played a little to get another drink. Along the way we ran into all kinds’ characters, drunks that could barely stand, hookers looking for date, hookers being questioned by police, a drug bust, a few drug dealers, a couple pukers and these three girls that wanted to walk to Fremont. Around 4:15 we headed home. I haven’t been out that late in ages. It was interesting. Saturday, the rest of family came by. We hung around the house; never got into the hot tub it was too chilly from the rain and wind. Nicky had a blast in my big master bathtub, though. He thought it was the best tubby ever. Amy, Nicky and I stayed home while everyone else when downtown. My mom was able to get three comped nights at the Plaza. They gambled and drank – good times were had. No wins to speak of, but Frank said the Plaza is back to the basics and he enjoyed playing there again. I'll have to check it out sometime soon. Sunday we were able to swim in between storms. Frank took Mike and Amy off-roading. Around 6:15 he called asking for me to come pick them up. The Jimmy wouldn’t start. I dashed off in my mom’s Blazer. They were in a retention basin off Blue Diamond west of Hualapai. I’ve never been there before and it was dark. I had some trouble finding it, only the wall is seen from Blue Diamond, I never knew it opened up on the other side. Luckily, I was able to find them. We hooked a tow rope between the vehicles. I towed Frank across the basin. I did fine until we had to climb the side. At that point I kept slipping and the tires were spinning. We switched. Steering the Jimmy anytime is a pain, this was especially challenging, but I managed. We got the Jimmy all the way up to Blue Diamond. We left it on the side of the road. Frank bought a part that he thought would fix the issue and we went back after dinner. By then, my mom, Blaine, Amy and Nicky headed back to Pahrump. Mike stayed at our house to watch the Grammy’s; he’d later be staying the night at the Plaza. The part wasn’t right. Plus, it was really cold it was rainy and started to snow. So, we decided it was best to call a tow truck rather than fuss with it anymore. An hour later, the tow truck followed us to our repair shop. Thankfully, it was only a seven mile tow so it wasn’t too costly. $71 said and done, had we not recovered the Jimmy ourselves it would’ve run around $400. Once that was taken care of we went back to the house. I packed Frank a bag; he decided he was going to stay at the Plaza with Mike. Shortly after, they headed out for a night of gambling and drinking. And I headed straight to bed. Six hours later, I was awakened by my alarm. Back to work. Weekends are too damn short. I was surprised to see it was still raining. The mountains are covered in snow, at least, it was a pretty drive on my way into work. I hope the sun comes out tomorrow. I’ve had enough of the rain and cloudy skies. It’d be nice if Nicky could run around outside before it’s time for him to head back to Chicago and be cooped up for another couple months. Amid our fun this weekend. We got word that Frank's dad was rushed to the hospital Friday night. He spent a day in ICU, his diagnosis was congestive heart failure. Saturday night he had improved, he was moved out of ICU. He was scheduled for an angioplasty this morning, but a blood clot was discovered. The new course of action was a bypass. Once the surgeon got a better look, he ended up with a triple bypass. Surgery was successful he's currently recovering in ICU. Here's hoping he's now on the road to recovery and that he heals quickly. 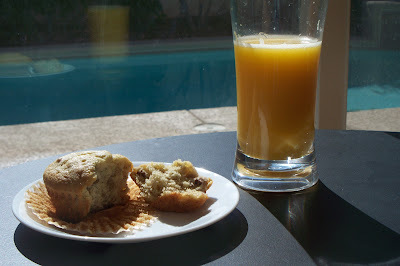 I made these muffins for breakfast yesterday. They came out pretty good. I didn't add raisins because Amy doesn't like them. Freshly grated apple would've been a nice addition. Next time, I'll add a little more cinnamon. My muffins baked in 16 minutes, so the recommended cooking time may be off. The muffins were best warm with a little bit of butter. 1. Heat oven to 400°F. Spray bottoms only of 12 regular-size muffin cups with cooking spray. 2. Crush cereal. In large bowl, stir together cereal, flour, brown sugar, cinnamon, baking powder and baking soda. Stir in remaining ingredients just until moistened. Divide batter evenly among muffin cups. Chasing and playing with a two year is a load of laughs, but it's also exhausting! I've had a lot of laughs with the family the last couple days. I haven't had much quality time with Mike, yet, though. He and Frank were off-roading all day Wednesday, he slept all day yesterday, and he, Frank and my mom have went out gambling at night. Tonight he'll stay the night and we have plans to go the Hard Rock and maybe a couple other casinos. While they've been out, I've played with Nicky and had time with Amy to chat and play cards. They went to my mom's last night, it looks like we'll spend time out there this weekend. After they left, I crashed as soon as my head hit the pillow. Hopping around like a frog, singing songs, playing with toys and swimming wore Nicky out. I was right by his side the whole time, so you can only imagine how exhausted and sore I was. Below is slideshow of our fun in the hot tub on Wednesday. Nicky loves to splash and he took it upon himself to bathe me. It was a riot. Grandma was lucky, she was spared. Not on the condo. But, boy do I wish that were true. We got an offer from Wynn. This is somewhat monumental. We don't get offers, well from Las Vegas Casinos. Laughlin likes us, or liked us. Usually, all we get from Wynn is $10 in free play every few months. In yesterday's mail, though, there was an offer for an Encore Suite at $120 with $100 free slot play. In my world that's a $20 suite. The only catch is that it's only good certain days this month. All but one are while family is visiting. We could possibly do a night next week after they leave. We should probably make the decision today and reserve it. Don't want to miss our chance. Mike, Amy and Nicky arrive at 8:00 tomorrow morning. I'm very excited. Frank will even be off with me tomorrow and Thursday. Yesterday, Frank was a busy bee. He drained the pool, our last water sample indicated solids were getting high, which means it's likely been a couple years since the pool has had a water change. It needs to be done before temperatures reach 75 to protect the shell or so we were told. Time is running out, so he got it started. It took all day to get it nearly half drained, talk about a slow process. What was especially funny is that we have no sewer on our street. So, the water drained down our drive away and then followed the curb down the street and around the block. Evidently the closest sewer is more than a 1/4 mile away. He also deep cleaned the grill. We haven't used it the few months, but temps are finally warming up. Time to get it ready for this year's grilling season. We broke it in by grilling up a couple bone-in ribeyes. Smith's had them on sale this week so we stocked up. They were very good. I'm happy I have six more in the freezer. Today's the last day of the sale, I think I'll pick up more. Hopefully, what's left is good quality, as well. Then, he worked on taxes. At first we owed, but once he figured in all of our deductions we will get a refund. Those funds will come in handy to pay down debt. Nice to get it out of the way early on. I went to bed around 11 o'clock, as I crawled under the sheets Frank came to tell me he was going to Red Rock to cash our winning football bets. A couple hours later, I recall him standing in front of me with a handful of hundred dollar bills. He said he won $800 playing keno. I swear he said he hit 6 of 7 numbers. The details are fuzzy, I sure hope it wasn't a dream. In addition to the chicken stock, I also tried three new recipes this weekend. Unfortunately, not all can be hits, I won't be making any of these again. They all turned out, but they weren't to my liking. 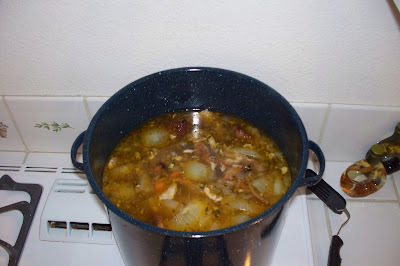 I had the camera out for the stock, so there's even photos to accompany a couple recipes. 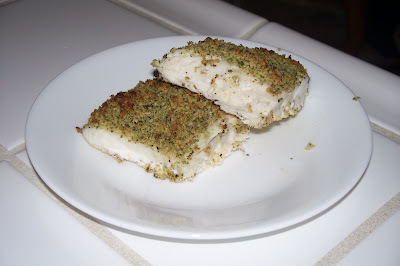 Roasted Halibut with Walnut Crust It seemed bland and dry. I used dried spices instead of fresh. Wonder if that's why? Heat oil in a large skillet over medium heat. Add the onion and cook, stirring frequently, until it becomes a rich, dark brown color, about 12-15 minutes. Meanwhile, put lentils into a sauceapan with one quart of water. Bring to a boil and simmer 15 minutes. Add rice, plenty of pepper and more water, if needed, to cover. Cover and cook over low heat until rice is done, about 15 minutes. Stir in half the onions and about 1 tsp of salt, then cover and let stand off the heat for 5 minutes. 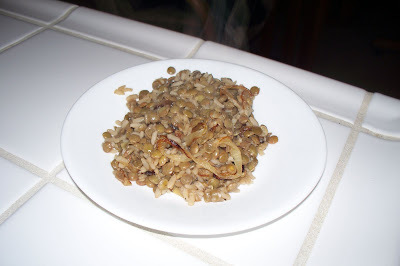 Cover lentil-rice mixture with the remaining onions. The initial flavor was good, but the aftertaste was horrid. It tasted like dirt. I've had lentils before, and enjoyed them but they never tasted like this. Didn't help matters that it doesn't even look appealing. The last one was Friday night's dinner. It reminded me of sloppy joe and chili. I like neither, so it wasn't a surprise I didn't care for it. Add olive oil to a 5-qt non-stick saucepan and place over medium-high heat. Add the ground beef, breaking it up with the edge of the spatula, cook until no longer pink. Drain any fat. Add onions and green pepper, cooking until softened. Stir in the jalapeno peppers, tomatoes, sour cream, honey, chli powder and salt. Add the pasta. Stir, cover, lower heat and gently simmer until pasta is tender, about 25 minutes. Stir every five minutes, to keep pasta from sticking. 373 calories, 4.8g fat, 24.8g protein, 42g carbohydrate, Fiber 2g, 52mgs cholesterol, 845 mgs sodium. I realized last week that I could have another use for rotisserie chicken. I could make stock. 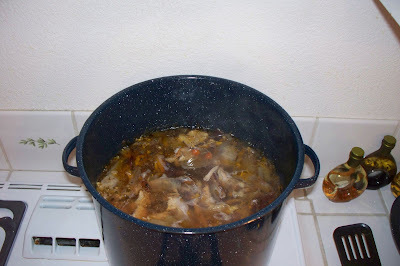 After I picked two chickens clean of white meat I tossed the rest into a stock pot. 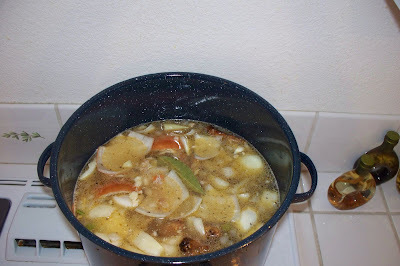 I added onion, celery, carrot, bay leaves, pepper and garlic powder. I brought it to a boil and let it simmer for four hours. 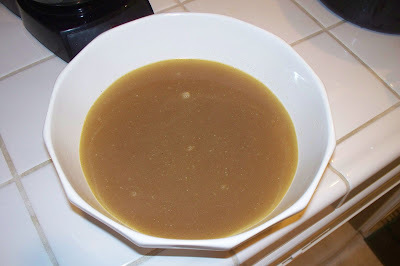 A portion after straining, all done, ready to cool and freeze.